Now available for a short time and in limited quantities. 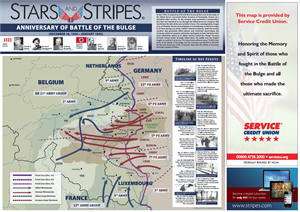 Stars and Stripes is offering a detailed map of the Battle of the Bulge, that raged from December 16, 1944 through January 1945. 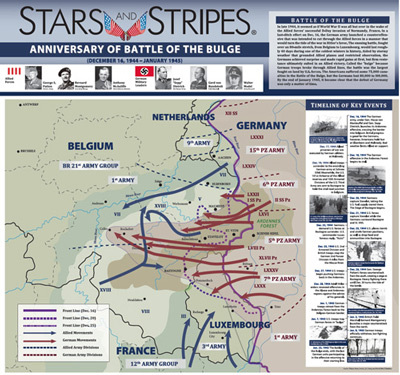 Follow the movements of the Allied forces led by Generals Patton, Montgomery and McAuliffe as they battled the troops Germany's 6th Panzer Army, Field Marshall von Rundstedt and General Model. Generous poster size measures just under 16-3/4" high x 24" wide. Map is printed in full color on heavy paper. 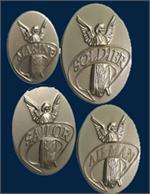 A must buy for anyone military history buff with an interest in World War II.